A government-run institution in Manila that serves as a shelter for people who have nowhere else to go is currently getting a lot of flak after a photo of a naked and malnourished child supposedly taken within the confines of the institution circulated online. The institution in question is the Reception and Action Center (commonly referred to as RAC) which is located along Arroceros Street in Malate, Manila. 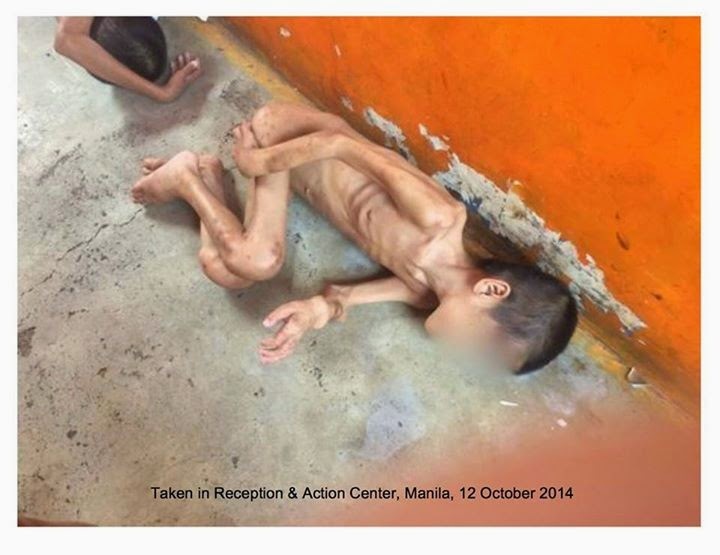 The photo of the malnourished child was posted by Bahay Tuluyan on its Facebook page on October 23, 2014. According to the same post, the photo was taken on October 12, 2014. It showed a severely malnourished boy lying naked on the pavement. Also in the photo is what looks like another child but the camera shot didn't fully reveal his body. Bahay Tuluyan is a non-government organization working with children in need of special protection. It seeks to "promote, fulfill, respect and protect children's rights." You can find out more about the work that they do on their website here. Bahay Tuluyan has sent the photo accompanied by a letter to the President of the Philippines, Manila Mayor Joseph Estrada, the Secretary of the Department of Justice, the Secretary of the Department of Social Welfare and Development, and the Chairperson of the Commission on Human Rights. The letter calls for an immediate upgrade or closing of the RAC. You can read Bahay Tuluyan's letter here. Bahay Tuluyan has also penned a petition on change.org titled Upgrade or Close RAC. The online petition is directed to Manila Mayor Joseph Ejercito Estrada. As of this writing, the petition was able to gather 1,218 signatures. On an update on their Facebook page timestamped on October 28, Bahay Tuluyan stated that they are yet to receive a response from the City of Manila, DSWD, DOJ, and CHR a week after they sent the letters. The photo has also reached the attention of the Asian Human Rights Commission. In a statement posted in their website, AHRC said that it "strongly condemns the Manila City government for its apparent outright neglect to improve conditions at the Reception and Action Center (RAC)". According to Bahay Tuluyan, the child in the photo is now in good hands after their intervention. The kid is now in the care of an "excellent institution working with sick children".